Osama Roshdi Askar graduated from the Military Academy in Cairo in 1976 and held a number of posts in the infantry ranks. Askar is reported to have served in the Central Military Zone and in the Army’s Operations Department, but he rose to prominence in the Third Field Army, leading one observer to describe him as a “son” of that unit. 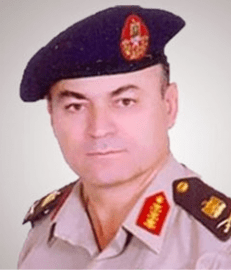 Askar commanded the 23rd Mechanized Infantry Division, a major unit within the Third Army, before becoming the Chief of Staff of the Third Army under Maj. Gen. Sedki Sobhi. Sobhi was promoted to Chief of Staff of the Armed Forces in August 2012; a week later, Askar was promoted to take his place. Askar led the Third Army—which operates in Suez and South Sinai—through several bouts of upheaval that threatened the stability of the region and the authority of the state. In late 2012 and early 2013, strikes and riots broke out in the Suez Canal cities of Port Said, Ismailiya, and Suez. Askar announced in January 2013 that his soldiers would not use force to enforce a curfew that had been declared in the region, despite dire warnings issued by then-Defense Minister Abdel Fattah al-Sisi about the instability. Askar and the Third Army continued to conduct both military operations against terrorists and outreach to the local population. Askar claimed in April 2014 that Sinai was “90%” calm and that the Suez Canal was totally under the government’s control. Askar and the Third Army have continued to call on the local population to support the state’s efforts to control the situation, referring to the Bedouin as Egypt’s first line of defense. Throughout 2014, South Sinai saw significantly less violence than North Sinai, with only three terror attacks being carried out in the province. The state, too, used a lighter touch in the region, with just two reported counter-terror efforts, neither of which was deadly. (In February 2014, however, Askar was hailed as the mastermind of an operation that killed 16 militants across the border in North Sinai.) Askar was regularly featured in the news, announcing development projects for the region or meeting with tribal leaders. In January 2015, after a major attack on a security compound in Arish that killed dozens of soldiers and policemen, President Abdel-Fattah El Sisi created a Unified Command for the Area East of the Canal and for Counterterrorism, promoted Askar to lieutenant general, and tasked him with leading the new command. In July 2013, Askar announced that his troops had seized 19 Grad rockets that were being smuggled—allegedly by Hamas—into Egypt to assist the Muslim Brotherhood. Terrorist attacks in Tur Sinai and against a military motorcade in early October 2013 prompted a military operation in response, which was led by Askar and resulted in five arrests. The Third Army took the responsibility of securing polling places for the 2014 constitutional referendum. Askar promised<>/a that citizens would be safe from the moment they left their house until their return, offering plans outlining steps taken by the government. Two weeks before the referendum, a group of Bedouin sheikhs handed large caches of weapons over to the government, and voting passed without incident in Suez and South Sinai.